JR Martinez Before Accident Pictures? Home > Politics & Government > Law & Ethics > JR Martinez Before Accident Pictures? JR Martinez is the actor who plays Brot Monroe in the soap opera All My Children. He served in Iraq in the U. S. Army and had a serious accident while in combat. I know how his face looks like now but I've never seen pictures of JR Martinez before the accident. I was wondering if there are photos of him when he was younger and wasn't a soldier yet. I read JR Martinez's story and I find it very inspiring, I think he is a true role model. If you find pictures of him before the accident, please post them. JR Martinez spent more than two years at the hospital undergoing skin grafts and treatments for burns that covered great part of his body. The accident happened when the left front tire of the Humvee he was driving ran over a land mine. While the physical injuries were difficult to heal, JR Martinez's mental wounds were much tougher to overcome. But he is fine now, and he has inspired many people to overcome difficult moments in their lives. Here are pictures of JR Martinez before and after the accident. JR Martinez was such a handsome man before the accident. I just watched a special report about his life and he is indeed a true inspiration. I wish him the best and thanks for the before and after pictures. I thank you for your service to protect this country and the sacrifices you made. I pray that people will see that beauty external and internally, it's not the color of our skin, how much we weigh, or how we look that makes us; it's the Spirit of Jesus Christ that shines through, it's by God's grace that you survived and for God's glory you will change lives of others that are going through difficult times. I'm amazed, this is the first time I see JR Martinez before the accident. He was handsome and looked absolutely different. Those burns really changed his face. I wish JR the best, he is sincerely a good guy. I don't get why his skin changed color, he's white now? His skin had a Latino color before and now it's very white. He looks like Michael Jackson! Wow, rude much? He was blown up and when the skin burns, so does pigment. Anyways, he's awesome! Good luck on Dancing With The Stars. Thank You ever so much, for your dedication to serve our country. You lost a lot, but God gave you the strength and courage to go on in life, and to help others. You are a very outstanding person to continue to give of yourself. I am so glad that AMC gave you the chance to portray a veteran that had gone thru the hell that exists. You are a really great actor, and I'm sure there will be many more roles for you. Keep up the great work that you do, both on and off stage. I wish you continued success in all you do. I will be always looking for you. God Bless You. I still he is handsome and awesome! Thank you for serving our country and putting your life on the line. You are indeed a true hero and an inspiration to all! I can't believe that you even posted this comment. THINK before you post. I watch JR on AMC and have always liked him. I am not a fan of DWTS but watched last night just to see him dance. I have to say, I love his personality. How can you post this comment? If it was meant to be funny, I certainly did not take it that way. You are definitely my hero and with all of my heart I say, THANK YOU! 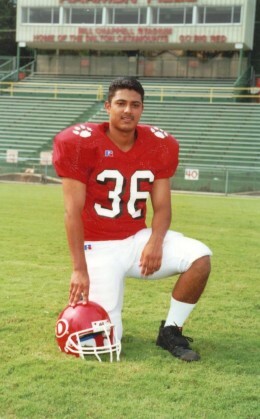 Great person like J.R Martinez motivate others and help to keep the hope alive and face the reality of the life. We appreciate all your service to protect us. God Bless you. He looks like Michael Jackson! At least he had the balls to go to war for his country. You're probably not even from this country and if you are, you are ungrateful. Making fun of him...he probably looks better than you. He is a handsome man now, I really like how he looks like! Even more so than his beauty on the outside... I love his spirit and beauty on the inside. Love you JR and good luck in all of your future endeavors! I agree! Indeed, he does not look like Michael Jackson not even close, he is very handsome. WTF is wrong with you people? How can you say such things? He is a real person! You watch too much reality t.v. and have become numb to REALITY! Yeah, He WAS a good looking man, but he is now a GREAT looking man. He has more personality, charisma and appeal than any of you ignorants on this post! Apparently your mother did not teach you right by any means. Fortunately karma works wonders on people like you. He is doing amazing on DWTS regardless of how he looks!! Just ignorant. He fought for the rights you have in this country... have some respect! Seriously I think he is beautiful. Those scars define his brave heart, and his attitude is an inspiration to many people. We should all have such an outlook in life, the way he does. It is simply amazing and believe that anyone that would date him, marry him, and have him in their lives is simply lucky. No one deserves the happiness the way he does...and boy how he will share it! JR. I am a former Marine and I want to thank you for protecting those who don't appreciate it. Your great and doing great on DWTS. Keep your head up and work hard at everything you do. There are many soldiers fighting for your rights, so you can sit at home and post stupid posts. Be respectful to those who put their lives at risk for you. I think he is more handsome now then before. He has such a beautiful smile. His inner beauty overshadows those scars. I wish you the best! God definitely picked the right person for this journey. Really? What the hell is wrong with you! He spent 2 YEARS in a hospital receiving skin grafts ON HIS FACE. You obviously are an absolute **** for even having the balls to actually post that comment. Can you even begin to imagine the pain and suffering he went through physically and mentally? I am not even going to waste my time commenting about you anymore. I will leave it at you are a loser that has no idea about what our military goes through every day fighting for the freedom of your dumb a**. Even after the accident, you can still see traces of his inborn (good) looks.... Now, he has a different kind of beauty, and not just physical. He's doing VERY GOOD in dancing with the stars. He deserves to win! Vote for him people, after all JR Martinez has been through, he should win this one. I truly hope Jr wins it all... he is AMAZING. One of the most beautiful people, inside and out. Thank you for your service to our country, that goes to all of our soldiers. He is so full of courage and true happiness, a true inspiration to what we should all strive to be. I actually think you are better looking today! It's like you had 2 chances at being 2 good looking men. You are amazing. JR Martinez is a great man. I really don't think that anyone should post replies to the negative posts on here. We all know that they are just wanting to get a response, if we ignore them they will go away. Now I don't know if JR will ever read all the wonderful things said about him, but you are a great man. You inspire millions and you have a great heart and sole. I thank you from the bottom of my heart for the sacrifice that you made for my family and I. Good luck to you sir. If I were thirty years younger I would pine for a date with you. You are a gorgeous man and a beautiful person. Your parents must be so proud of you, I consider you very inspirational. Watching you tonight on DWTS I felt inspired to work even harder on being a better person. Thank you, Thank you. You also have much talent for dancing. Keep up the good work and the Mirror Ball Trophy will be yours and well deserved. His skin had a Latino color before and now it's very white. Is that the only thing bothering you? The skin colour? Educate yourself for Pete's sake and stop making an utter and complete fool of yourself. JR....if I were single and younger, I would give all my worldly goods for a good man like you. Most women don't get the luxury of having a "real man" and in my books I say you are the real deal. Thank you for serving our country despite the few dumb people we have here. Basically, our people are good...please don't judge us by the few ignorant people who want to say hurtful things. They are the ones I'd like to send over to fight, cowards! God Bless you and good luck in all. Some things need to be thought but not said, this is one of those cases. If that was meant to be funny, it wasn't. That's all. Maybe because he had skin graphs done on his face....which I am sure changed the color of his skin. Before or after - doesn't matter. He looks good now and I consider him a handsome man. He is also an example for most of us. Just don't listen to the haters. Responding to the skin color comment. I did not find anything humorous about your skin color comment. Have you ever heard the saying if you don't have anything nice to say don't say it all. You better pray that you or one of your loved ones never gets into a accident. Grow up and get a life. You are probably as dumb as they come. If only you read a little bit you would know that we all are the same color under the skin. The guy is a hero. I think JR Martinez has such a natural gift for dancing. What a true talent. And I agree...he's a beautiful and inspiring man. And I thank him from the bottom of my heart for his service to our freedom and our country. My father was sent with the 101st Airborne Division to Iraq during Desert Storm...when I see JR I think of my dad and all the other brave men and women who eat their meals cold, go without showers, sleep with one eye open...all their sacrifices for us to be free. Love you JR! What a dumb and stupid scenario, he looks nothing like Michael Jackson. The color of his skin or the feature of his face really doesn't matter, here is a hero that survive a terrible war infraction, thank God the holy spirit was with him and he survived. You need to really evaluate yourself and your prejudices, because you sound dumb and uneducated. Please people....you better thank God every day for human beings like this man. Skin color and his looks have nothing to do with anything, we all breath and bleed the same, have some respect. And along the way, if his story changes people for the better, we all will be a little more beautiful inside. I think he was gorgeous before and even more gorgeous now! You go JR, I hope you win DWTS this year! What the hell is wrong with you? He's a hero and its not worth explaining to someone as low as you. Is he married? ANY girl would be lucky to date him. *sigh* they just don't make gentlemen like that anymore. JR, you are so beautiful. Inside and out. Bless your heart. NO, he does not look like MJ! That's just the wrong thing to say, to anyone, for any reason (unless they're an MJ impersonator)! Jr's nose doesn't look like it belongs on the face of a gorilla, and when he speaks, he sounds like a man, not a little girl! Get a freaking life! Seriously, if you don't like Jr. Martinez, or you feel that you have to let your negativity show, you should engage your brain, before you put your mouth in motion! Better still, why don't you just go away, and don't visit this page at all? I love you, Jr.! AND, good luck on DWTS! I've watched every week, and you are AWESOME. I don't get why his skin changed color. Okay. First of all, I think that J.R. Martinez looks better now than what he did before. Second of all, that offends me because I, myself was burnt about two years ago. I don't know how you could even say that. He served for you and was injured and yet you have the guts to say something like that. I'm not one to get upset easily, but this really upsets me. I am 16 years old I am totally fine with my injury and I really don't care what people think about me, but its people like you who make people like me feel like complete crap. No one is perfect and everyone has their story and everyone has their flaws and people like J.R. and I have the opportunity to wear our story for the whole world to see. Next time you say something, you might want to think about it and who you are offending. Just saying. Uhmmmm that's not white?! He still that latino color it's just not as dark but that is NOT white at all! To be honest that was rude... What if that was you?! He's a good person no matter what he looks like! Watching dancing with the star's right now! God Bless! Some people are so insensitive. He almost died for you! You are inconsiderate! He is still handsome. And his spice for life and charisma is outstanding. If I weren't married I would not mind waking up to that face every morning. Its the inside that counts, and the outside ain't that bad either. I think he is still pretty damn hot, JR's got it going on! You are one talented gentleman, born to dance. In one sentence if I was asked to describe you it would be with these words. "A. J. is a real class act". You've got it all, your God-given gifts and your caring, compassionate nature. You are a man with a special mission and I wish you the very best that life has to offer. I first saw JR on AMC and could tell immediately that he was a gorgeous man who had a bad accident. He is a talented actor. Now addicted to DWTS and watching him dance. OMG he most definitely got it going on. I find him extremely handsome, from the way he looks to the way he moves, and even speaks. He was attractive before his accident but I think even more so after. Because of his accident he exhibits a positive attitude toward life that is undeniably attractive. I hope he wins! He actually still has his original skin complexion. But he is still a handsome man and he is doing his thing with acting and everything he puts his mind to. Keep doing you love. I agree with you 100% ; I don't watch soap opera but when I 1st saw the show dancing with the start. I can easily see the joy in his heart. God is good, you are a witness and that what makes you shine and attractive. You shining and shake it, you are awesome. Those of you that out there that are just criticizing; I can see where you heart is, you are not happy within yourself. Criticizing is your comfort zone. Live life to the fullest be happy, and take a good look at yourself before you speak. I agree!! Tonight he got a perfect sixty and is doing great!! I'm 14 and I look up to his courage! He's amazing and a great dancer and those posting rude comments should open your eyes and realist what happened to him! I'm sorry but I disagree with you, he is not handsome at all. In fact, I think a Hollywood producer might cast him as one of the monsters in a scary movie. Sorry to say that but it's the truth. I already know who is going to win... you mister. You have all the courage it takes to be an awesome human being. I think Jr's personality makes him who he is, every time you see him he always has a warm smile that just arms your heart. I seen a footage of him when he was in the hospital after his accident and he gives all the credit for him even being alive to his mother. She told him after he saw his face for the first time after the bandages came off that it only mattered what was on the inside not what was on the outside, because true beauty only comes from within, and he said that at that moment he chose not to be bitter but to let his true personality shine through. I personally think that he is a true hero, and he is such an inspiration to others. Every time you see him he always has that fantastic smile of his face. I hope he wins on dancing on the stars because I think he has the best dance moves. You go JR, you are my hero. you have so much talent, and your personality shows just how handsome you are, Your smile could warm any cold heart any day of the week. I didn't know he was so handsome before the accident. Now that I see the pictures I realize he was a very beautiful man. Not that there's anything wrong with him now but he looked really nice before. White? Sorry but I think you need to look again. Have you see JR Martinez? He is not white at all. You definitely need goggles. That was totally rude of you dude. Have some respect for a person who was fighting for you overseas. He was separated from his family just to defend our country and make us feel safer. JR Martinez you're amazing keep on trying and fighting, we all love you at home and we hope you win the competition. My daughters absolutely adore you JR.
Also the after pictures is a photo of JR Martinez today now that he is famous, he has on makeup and GOD knows how many lights are shinning on him. Still a handsome guy! Keep up the high spirits and never let people bring you down! You know how people always tries to make you feel bad, don't let that happen to you. JR Martinez is one of the most beautiful people I have ever seen. His smile radiates, his eyes twinkle, and I am proud that he is an American. Because that is what an American hero is all about - shining through all adversity. He is a winner. The contest of life has made him a winner and he will continue to win with all he endeavors, because he has a great heart, and the love of life. God Bless you JR we love you. What's wrong with you, he's a hero, and so is MJ, use your head. JR Martinez is one of the reason you can be seating in front of your computer while your country is safe from any threats. You are the Man! 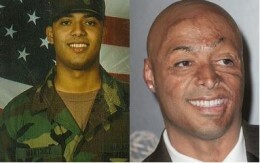 Thank you for your courage and service JR Martinez. America appreciates all that you have done for your country and I hope you have a wonderful life. I bet people say the same about you. Real looks are internal and external, you must lack the first part. We can tell from your post that you are ugly on the inside and out. I really love you JR! And I also thank you for everything that you have done for us. And when things went wrong you took it like a man and fought for your life. Not only that, but you managed to be where you are today. That's what I call a truly brave man. His skin had a Latino color before and now it's very white. He looks like MJ! U have no respect for people. He was injured trying to serve our country, you should consider yourself a failed attempt of a human being with no respect and you should be ashamed. Beauty is something that probably you don't understand.... he suffered all this injuries trying to protect you and all your family from terrorism and you don't even see it. I feel really sorry for you. He is handsome because he is a brave soldier. and I am very proud of him for being dancing and having so much fun! Latin blood! Great! J.R. is very attractive and do you know why he is so attractive...not because of his physical attributes but his intestinal fortitude! He took one of the most horrible things a person could ever go through and survived it. Not only survived it but became a wonderful person that has inspired others there is life after all this. He can smile and laugh and treasure life 200% more than he ever did before. Congrats JR and we love and respect you! Dancing with the Stars and the national attention brought J. R. within my knowledge. So I sought information on him. I found it. Next thing I am going to do is tell every person who comes to me with excuses for this or that; look at J. R. Martinez. God will bless you but you must do your part. What a great remarkable young man. Yeah, um if you honestly think he was injured protecting our freedom you are sadly mistaken. He was driving a Humvee when his left front tire drove onto a land mine in a 3rd world country that we shouldn't even be in, yes this guy deserves to be hoisted up and cheered for, for Tue bounce back that he did, but for you regards that talk about "oh my he is such a HERO because he fought and protected our very rights by going to a foreign country to take orders from people that just care about oil and covering up secrets," come on, don't bring the war into this. Just comment on how he had a life altering thing happen to him and he came out of it smelling like roses, and to you people that say he is more handsome than before the accident!? Are you serious?! What is wrong with you people, first of all you are a bold face LIAR! Stop being fake. It's just human mature AS SINNERS, (for all you biblical hypocrites out there that bring the bible into this), to look at physical appearance first and foremost, to me the guy that commented on looking like MJ, although harshly put, is speaking more truth than anyone else. You people are the reason the world is the way it is and it is for that that I am scared for mankind, goodbye fakes and liars. Really? What the hell is wrong with you! He spent 2 YEARS in a hospital receiving skin grafts ON HIS FACE. You obviously are an absolute **** for even having the balls to actually post that comment. So you are telling me that if our soldiers were not over there then we wouldn't be free in America? Stop saying the comebacks that some Americans like to say when they don't know what in the hell they are speaking about! Stop falling back on, "he is fighting for us to be free" our ancestors were the only soldiers to fight for our freedom. It was called the civil war so leave the war and your dumb opinion out of it. I am an E-5 in the United States Marine corp, I have looked down the rifle at another human being and pulled the trigger until they were not a threat anymore, trust me, I was not taking Haji's life for your pathetic freedoms, go back to saying how he was more handsome before his nasty accident. You people make me sick to my stomach. he's white now? His skin had a Latino color before and now it's very white. Go lock yourself in a basement and stay there. You have no idea what you're talking about, have some respect for a man like JR Martinez, a true winner of life. I agree for the person he thinks they'd cast him in a creepy movie you're wrong. Watch him as Brot on All my Children on youtube he's so super nice and has a great personality. Stop judging people its wrong and it'll come back to you soon. He fought for your life in the war that's why his face looks like that he did that for you! May God continue to keep JR. His attitude is inspiring and he is very attractive. Wow, that was really a dumb comment. He's not white now. If you read the article or know the story, he had skin graft so obviously with that and the burns his complexion isn't what it used to be. With that being said, he still has color..enough of it. He's nowhere comparable to Michael Jackson. His looks have changed obviously but his beauty comes from within. His personality is beyond amazing and I think this makes him very attractive and handsome in spite of the scars. He is a true hero and a handsome one at that. And the way he danced on DWTS, well, he oozed sexiness!! I'm so happy to hear him and his long time love are expecting a baby. He deserves the best. How ignorant can you get? It doesn't matter that JR was injured and had his looks changed in the service of our country. I am SO THANKFUL that people like JR love this country enough to stand up and defend all of us. What I like about JR is that he is out there doing what he can to help other injured soldiers to get through what they are going through. JR could have become very bitter about what happened to him. What I notice the most is that big, beautiful smile that he has and his amazing spirit. We need more people like JR to go out and make a difference in the world. He is a true American hero unlike most sport figures and entertainers. I cant believe how easily people are offended. I don't think the person intended to offended when they asked about his skin color. His skin color does look lighter than the pictures before the accident. I also don't think many people are aware that with burns, skin color IS affected. Similar Threads for: JR Martinez Before Accident Pictures? David Arquette Car Crash Accident Pictures? Sugarloaf Maine: Chairlift Accident Pictures? Pedro Martinez, Don Zimmer: Youtube?